Derivan Face & Body Paint is non-toxic, safe, and washes off with soap and water. It provides excellent coverage, dries quickly and has a vibrant colour range. 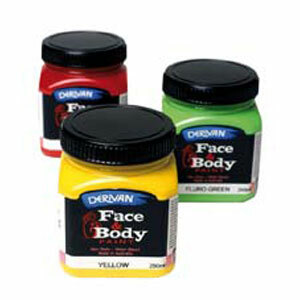 Derivan Face & Body Paint is an ideal face and body paint for theatre, children's parties, fetes and fairs. It conforms to all government regulations and requirements. It is recommended you apply a barrier cream or hand cream prior to using Derivan Face & Body Paint to help make removal easier.